1. The Biggest Loser Dessert Cookbook: More than 80 Healthy Treats That Satisfy Your Sweet Tooth without Breaking Your Calorie Budget. We love the show The Biggest Loser, so it’s no surprise that we also love The Biggest Loser Dessert Cookbook. With yummy recipes and healthy tips and tidbits from Chef Devin Alexander, past contestants and experts (Bob Harper! ), this book shows you how to satisfy sweet cravings — while not feeling deprived in the least. From the Waffle Ice Cream Sandwich to Strawberry Cloud Soufflés and Pecan Praline Cookie Thins, there’s a lot to crush on. 2. 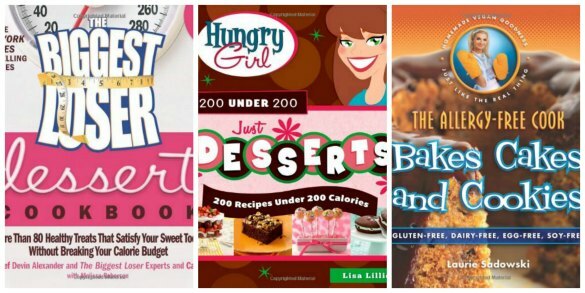 Hungry Girl 200 Under 200 Just Desserts: 200 Recipes Under 200 Calories. We love Hungry Girl. (She was actually one of the first people who granted us an interview over on FBG, and we’ve been forever grateful!) She is the ultimate at making better-for-you versions of unhealthy stuff that actually taste like the real thing. Yes, it’s still processed and not organic … but sometimes you just need a Snickers Cake Mug for crying out loud! And her new healthy dessert cookbook, Hungry Girl 200 Under 200 Just Desserts: 200 Recipes Under 200 Calories, delivers. From Red Velvet Cake Pops to Whoopie Pies and Cannoli, it’s the ultimate for whipping up a dessert that satisfies without a lot of extra calories. And so many options — 200, in fact!